May 2, 2016 – In this episode, our time machine touches down during the months after Pearl Harbor, as Hitler’s U-boats bring the Second World War to the Gulf of Mexico. On board the doomed steam merchant ship Heredia, we’ll bear witness to disaster with the Downs family, through the eyes of eight-year-old Sonny. We’ll also meet the commanders of two U-Boats, dispatched by Germany’s Admiral Dönitz, and see how they combine their duty to the Reich with offering mercy to survivors of their attacks. 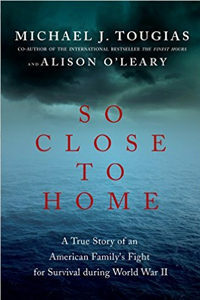 Our steward on this journey is Michael J. Tougias, co-author with Alison O’Leary of the book: So Close to Home – A True Story of an American Family’s Fight for Survival During World War II . Mr. Tougias is the New York Times bestselling author and co-author of two dozen books, including The Finest Hours, which served as basis for the Disney movie out in January 2016. He’s also given us Fatal Forecast. Overboard. King Philip’s War, Rescue of the Bounty, and There’s A Porcupine In My Outhouse: The Vermont Misadventures of a Mountain Man Wannabe. You can find him at MichaelTougias.com, or @MichaelTougias on Twitter.